The Joliet Region Chamber of Commerce & Industry and The Council for Working Women are excited to announce Jen Howard as the 2018 recipient of The ATHENA Award. 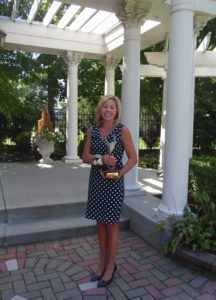 Jen became the 31st Award recipient, and was honored at a luncheon on Wednesday, September 12th, 11:30 a.m., at the Jacob Henry Mansion Estate’s Victorian Ballroom. The ATHENA Award Program was developed in 1982 to honor exceptional female or male leaders who demonstrate the highest levels of professional excellence, contribute time and energy to improve the quality of life for others in the community, and actively assist others, particularly women, in realizing their full leadership potential. It is the case that long before Jen knew of ATHENA and the award she now represents, that these goals have always been a common thread throughout her professional and personal life. Fast forward several years and in true form of following her entrepreneurial spirit, she started a business locally – TCBY located in Shorewood, Illinois and then in Naperville, Illinois. Her original Shorewood location is in the top five stores in the country during their busy season. In recent years, she has been actively involved in the Will County and greater Joliet area, her commitment to the community has been nothing less than that of a labor of love. From giving back to Joliet Junior College, to connecting people with their leadership potential, or encouraging women – whether TCBY employees, colleagues, fellow chamber members or fellow Rotarians. She is honored and humbled at the opportunity to serve in the Executive Positions she has, and excited to take on the role of Rotary President mid-2019.